MANILA — The Philippine government should take control of the country’s largest shipyard, the defense secretary said on Thursday, after officials raised concerns that Chinese companies seeking to take it over would act as agents of Beijing, projecting China’s power deeper into the region. Among the foreign companies expressing interest in the sprawling shipyard on Subic Bay are two Chinese firms, one of which is state-owned, according to Philippine officials. They have voiced fears that a Chinese takeover of the yard would give a strategic foothold to China, which is expanding its economic and military presence in the region and has seized islands in the South China Sea that are claimed by the Philippines, among others. Defense Secretary Delfin Lorenzana said he had raised the issue of the shipyard in a meeting on Wednesday with President Rodrigo Duterte, who has tried to improve relations with Beijing, worrying American policymakers who have long seen the Philippines as a strategic check on China. Also in the meeting were Foreign Secretary Teodoro Locsin Jr. and the country’s economic managers. Mr. Duterte’s position on the matter is not clear. Subic Bay, about 50 miles northwest of Manila on the island of Luzon, was the site of a major American naval base during the Cold War, and it opens onto the South China Sea. Officials have not identified the companies that have shown interest, but the shipyard is becoming available as concerns mount in many countries that Chinese companies, even ones that are not government-controlled, often engage in industrial espionage and act as tools of the Chinese government’s influence and spying efforts. Justice Antonio T. Carpio of the Philippine Supreme Court, an outspoken critic of Mr. Duterte’s China-friendly stance, is among the officials who have publicly warned against a Chinese presence in Subic Bay. 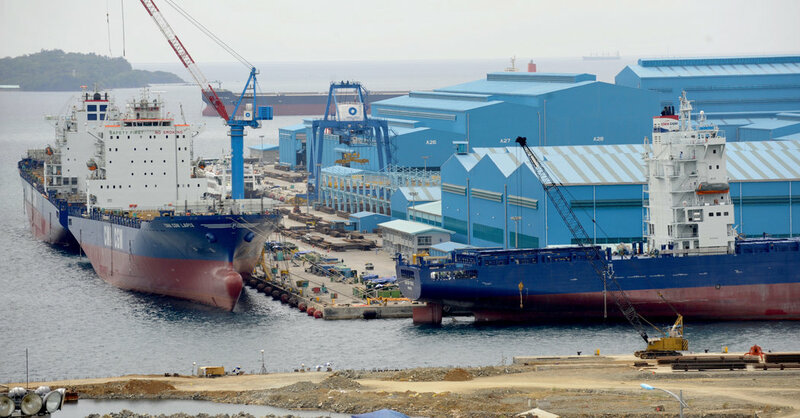 A Philippine unit of Hanjin Heavy Industries and Construction Group, a South Korean company, took over the site in 2006 and built the shipyard, which grew to employ more than 20,000 people and has built large cargo ships. But demand for new ships has slowed, thousands of workers have been laid off, and the Philippine arm of Hanjin, after defaulting on some $400 million in loans, filed for bankruptcy this month. Mr. Lorenzana, the defense secretary, said the shipyard could be used to help the country build up its naval forces. The Philippine Navy hopes to buy 20 ships in the next decade, he said, and the Coast Guard and the Bureau of Fisheries have pending orders for vessels. “So I think there is enough jobs for this shipyard for the Philippines,” Mr. Lorenzana said, who is seen as among the officials in Mr. Duterte’s cabinet who have been wary of the Chinese military buildup in the region. The government could take over the yard completely, he said, or lease a majority stake to someone else while keeping a minority share. “That way we can also have control,” Mr. Lorenzana said, adding that the government’s finance department was still studying his ideas. In recent years, China has occupied and built military bases on formerly uninhabited islands and reefs in the South China Sea, far from the Chinese mainland and much closer to the Philippines, Vietnam, Indonesia, Malaysia and Brunei. It also claims much of the sea, and its potentially lucrative oil and gas deposits, as its territorial waters, leading to tense encounters with its neighbors and the United States, which regularly sends naval ships through the sea to establish the right to navigation. Most of the world regards the sea as international water, and an international tribunal made a sweeping ruling against China’s conduct in the region in 2016. The South China Sea has emerged as the “most critical” security challenge for the Philippines, Mr. Lorenzana said.